Being a kiter for over 13 years, there have been times where I’m starting to feel like my riding is plateauing and I find myself becoming incredibly picky about conditions. I become more and more desperate for windier, intense and extreme conditions. I find myself desperate for those really windy “Victory at Sea” days with large waves. I guess it’s the classic junkie scenario where I find myself needing a bigger and bigger score. I consider myself a waterman. I have been surfing my whole life and so kiteboarding was a natural progression. But surfing is still a big part of my life. That isn’t going to change anytime soon. But herein lies the same problem. I constantly desire bigger and cleaner waves. When paddleboards started getting smaller and lighter, I found a temporary fix. 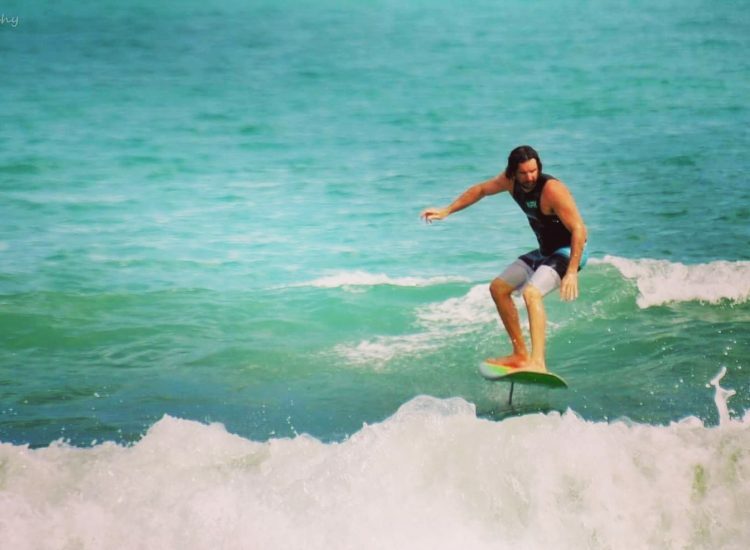 Riding small waves with a paddleboard gives a slight resemblance of riding bigger waves. I still love my SUP when the waves are small and they are also a great tool for accessing certain waterways while getting a workout. But like all things, its time to progress and move on to the next big thing. Just when I was starting to think that everything was plateauing once again, foils started to show their face. At first it was tough to find them. Picking off used ones from friends in different areas and trying to figure out how to ride them. At first we thought we wanted to learn in really light winds with small kites. Turned out, if you didn’t know how to ride them then this just made it more difficult. Then the pull behind the boat attempts began. The only thing we knew about this came from wakeboarding. So full speed ahead. Ouch. The scariest fall was when I landed on the wing right on my throat (there is video to prove it). But persistence and desire to master something new prevailed and I figured it out. There were still some gnarly falls and close calls but I was foiling. Staying upwind was no longer an issue. Riding smaller kites in lighter winds, opened up a new set of elements. Different foils came out. They became easier to find and we even started selling some! Once the short masts and big easy wings started to roll out…the trend was here. It’s been great to watch the evolution of foils. The short masts really revolutionized the way people learn and where they can ride. Programs like Slingshot’s Foil-Academy have greatly increased the availability of learning materials and information. So even though I feel that I could never truly “master” foiling with a kite, the buzz of learning something new slowly started to fade just like anything else. But suddenly, I saw a video of some guys actually paddling into waves with a foil. Just like they were surfing!! What?! Why haven’t I tried this? Ive certainly rode waves with the foil on the kite. And we all remember Laird Hamilton towing into waves back in the day on his modified Air Chair. So what did I do? I took out our demo Slingshot Simulator with the stock kite Hover Glide wing and 24” mast. It was kind of blown out and around waist high at best. The small wing made it fairly difficult to catch waves. There was a lot of extra drag. But I managed to fight my way into a couple. And to my surprise, I was straight up foiling. I would “porpoise” from time to time but it was starting to click. Since then I (with help from friends) have experimented with different boards, different wings, different mast heights and more. It has me excited for the “something new” again. It gives me my fix. The waves don’t have to be big. They just have to be enough to foil. I even shot the Cocoa Beach Pier the other day! Yes I rode through (under) the pier while pumping and riding a wave on the foil. So if you’re like me, and ready to try the next thing. Then this may be the next thing for you! Feel free to call, email or stop and ask any questions. so i am just beginning to get into kite surfing,,,wondering what speed most foil boards begin to rise up? also,,what gear or company should i look into for a “starter kit” to kite surf,,i live in jupiter so most events/groups around here go to juno beach or the lagoon in stuart. The speed really depends on the size of the wing and your body weight. The bigger wings will start to create lift around 7-8 mph on average. There are many great brands. Slingshot offers great beginner setups. So does NP. So take a look at the Fkite and NP Glide. Let us know if you have any other questions!